I had the BEST intentions of getting back to posting regularly, but January has been so tough guys! Not only is it freezing outside and so hard to take photos, It’s also hard to shoot during the work week. To top it off it gets dark SO early that there is rarely enough time to snap a few photos. The struggle is real! With how cold it’s been I’ve got spring on the brain. I’ve been dreaming of warm weather, more daylight and all the cute new spring styles. 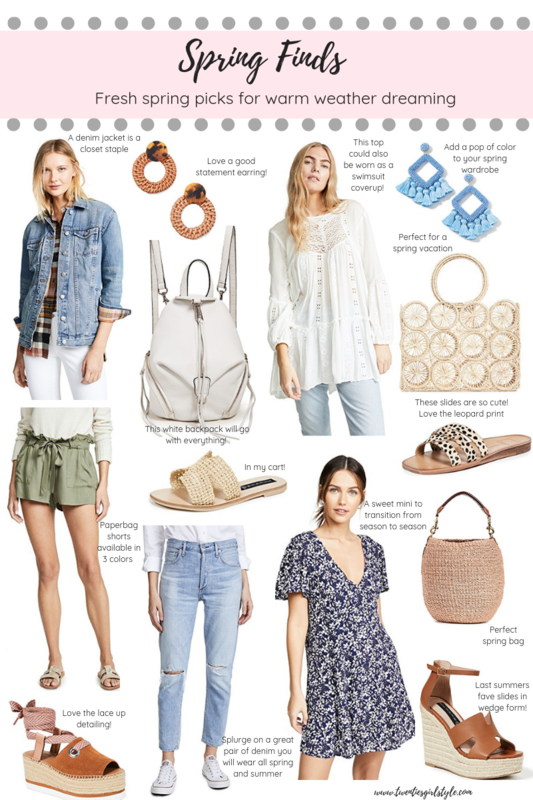 I’ve spent lots of time perusing the Shopbop site and adding all the spring essentials to my cart. Shopping for cute spring styles definitely makes the winter chill a little easier! Check out some of my favorite Shopbop spring finds below!